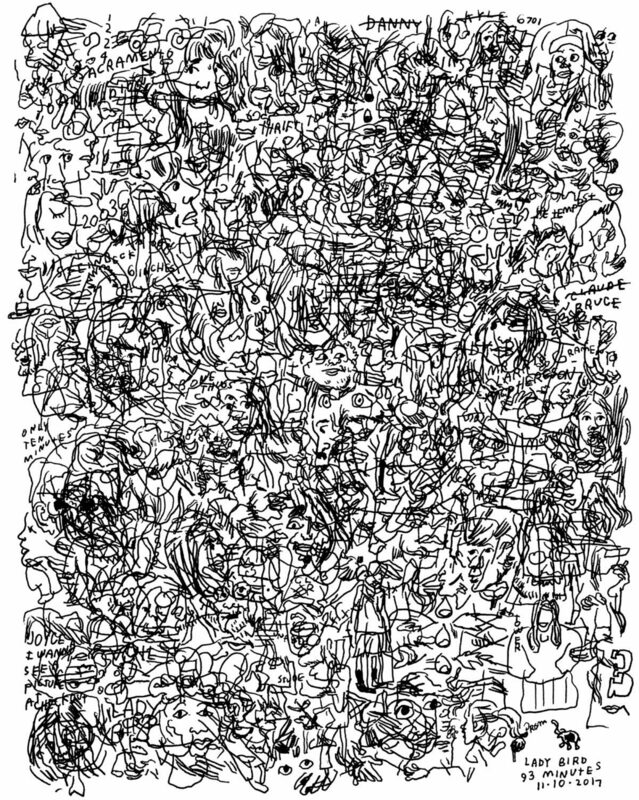 After hiring the insanely talented Jason Polan for some illustration work, we discovered the artist behind the New York Times' Every Person in New York also enjoys the unique hobby of drafting intricate, free-form doodles while watching movies. From afar, these pieces appear to be messy black voids, but upon closer inspection, distinct (and often unexpected) elements of the films are revealed, transforming the absent-minded notebook squiggles into something more meaningful. 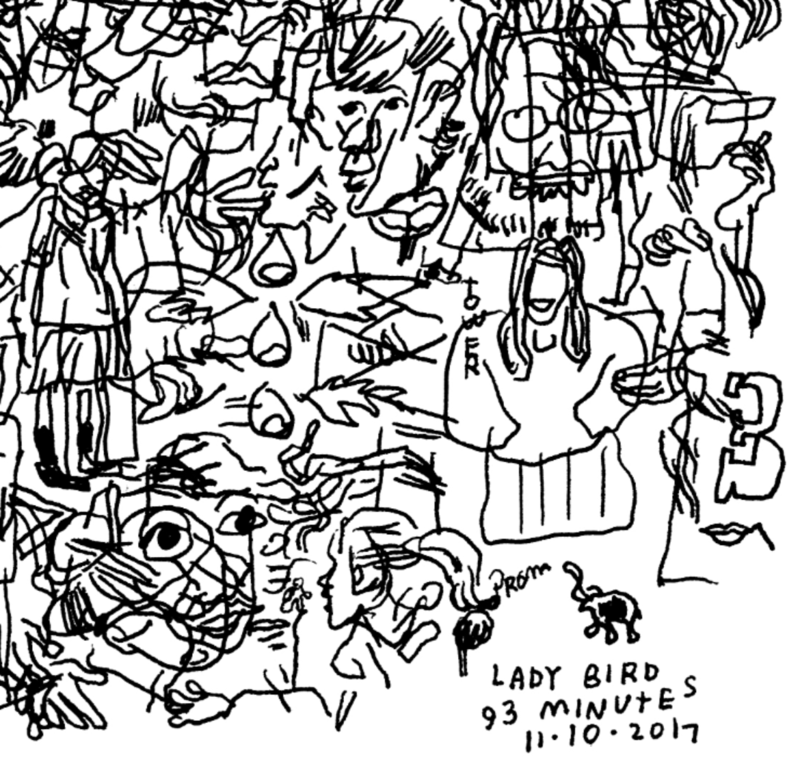 We asked Jason to watch one of our latest releases, Lady Bird, and give it the proper doodle treatment. 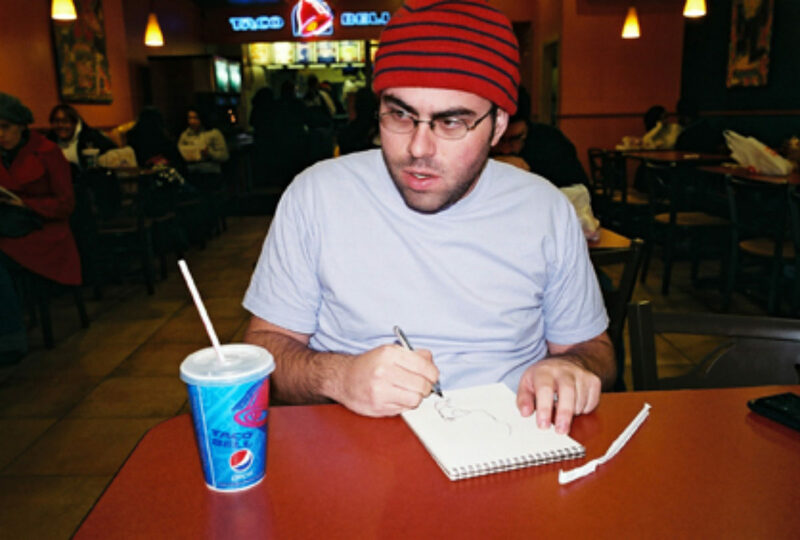 Below, you’ll find the finished drawing, as well as quotes from Jason about his process, limitations, and how, rather than distracting him, doodling greatly enriches his movie-watching experiences. I set up ground rules where I have to have seen the movie before, because it’s a different experience when I’m drawing during the movie because I’m not paying attention in the way I normally would. So, the way I did this one was I saw Lady Bird in the theater and then watched a screener the next day. And I only draw while the movie’s on. 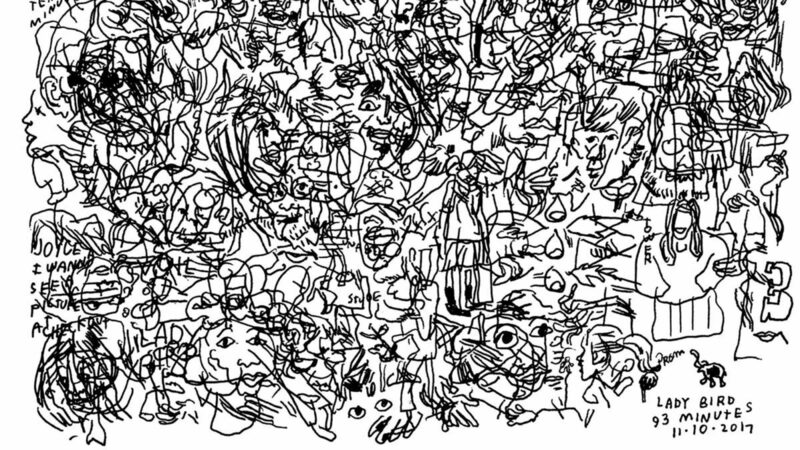 They’re duration drawings. Sometimes I’ll draw at concerts and stuff, but I find I don’t want the drawing to get in the way of the experience that’s in front of me. Other times, the drawing helps me tap into that experience. And sometimes they just help me remember and enjoy things more. I try to go top-left to the bottom-right, sort of like how you read, but it gets jumbled pretty quickly, because I’m not adamant about sticking to that rule. And if I see a blank space, I’ll go ‘Ooh, I’ve got to fill this in’. I’m not making too many conscious decisions. I’m just putting down what I see. I’m not even looking at the paper while I do it. I’m always worried that I’m gonna mess up something when I do these, so I try to catch myself and make sure to actually see the thing happening for me to draw it—if I wrote a quote down incorrectly or something. But I know that given the whole aesthetic of these, it seems like it’d be hard to actually make a ‘mistake’. In the bottom-right, you can see [Lady Bird’s] friend Julie who she ends up going to prom with. That’s her when they were trying out for the play and standing on the stage with her hands in her pockets—there’s just something about her look I found interesting. This was a good movie to do something like this for because there were so many specific visuals that lent themselves to this type of work. With this one, I was primarily just drawing the main character’s face a lot because there were so many shots of her face and hair. And a lot of Laurie Metcalf just because I loved all her facial expressions. 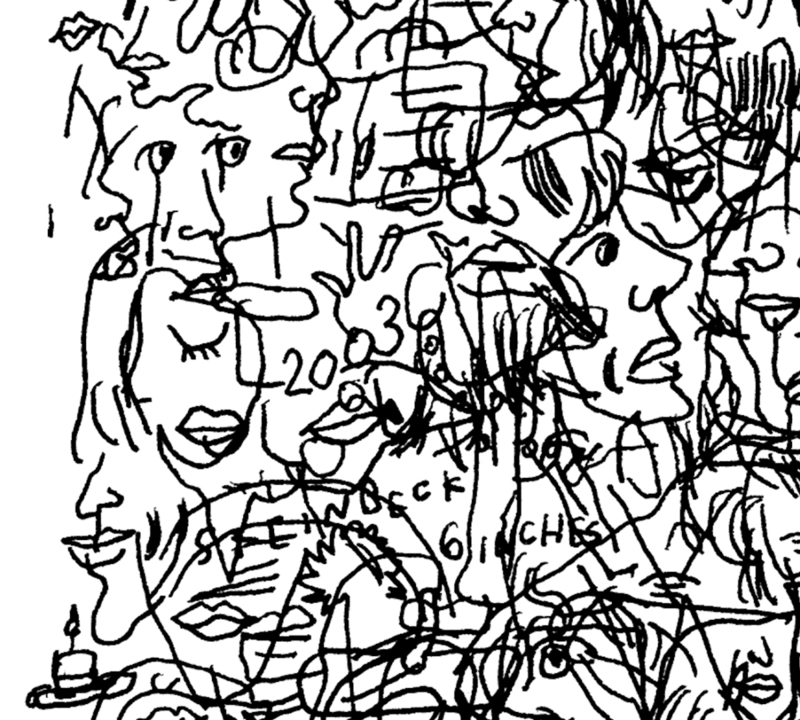 I like the idea that somebody can be looking at [my doodle] after seeing the movie and see some of the things they remember. But I do understand that, at the end of the day, it does look a bit ridiculous. This interview was edited and condensed for length and clarity.